Lasagne is one of my favourite dishes and has been for as long as I can remember. For me, it is the perfect comfort food, and an ideal weekend treat. Like many of the recipes that I cook regularly, my Lasagne recipe is largely based on my Mum's recipe, that she cooked for us when we were growing up. It always makes my laugh when my mum makes lasagne because for some reason she can never remember what order the layers should go in. She asks every single time! There are always new food trends on the scene; superfoods to try, elimination diets that are the new big thing; and whilst I do enjoy staying current and trying new recipes and ways of cooking, there is definitely something to be said for family recipes that have been tried and perfected over the years. I am a bit sentimental and old fashioned about these things! I still hand write all my favourite family recipes in a book that I one day hope to pass down to Little Whisk. I just hope that she will be as passionate about cooking as I am. My recipe for lasagne is a simple version with beef bolognese, but instead of bechamel, I substitute with a cheese sauce which I think really helps to give it a richer flavour. I am incredibly biased but I do think this is the best recipe for a simple beef lasagne. Give it a try and please do let me know what you think. Heat the olive oil in a large pot with a lid. Fry the onion for 5 minutes until it is starting to soften and then add the garlic, fry for another couple of minutes. Add the mince and brown, using a wooden spoon to break it up as it cooks. Crumble in the beef stock cubes, and sprinkle in the herbs. Add the wine, tomato puree and stir well. Allow to simmer for 5 minutes until the liquid has reduced slightly. Add the chopped peppers and mushrooms to the pan, along with the tinned tomatoes and sundried tomatoes. Season and mix well. Bring to a simmer, cover, and allow to cook for an hour, until the meat is tender and the sauce has thickened. Check regularly and if it is getting too dry then add some water. When the bolognese is nearly ready preheat the oven to 180 degrees centigrade. You are then ready to make the cheese sauce. I am pretty lazy when it comes to making cheese sauce and I normally cheat. Instead of making a roux and then adding the milk slowly, I normally just chuck everything in. This works well as long as you stir the sauce constantly and you cook it slowly on a low heat. For the cheese sauce - put the butter and flour into a pan and then add the grated cheddar cheese. Stir well so that the flour coats the cheese. Add the milk and season. Cook on a low heat stirring constantly until the cheese has melted and the sauce has thickened. I always just let it come to the boiling point and then turn off the heat. If however, you prefer to make a cheese sauce the traditional way then please go ahead! 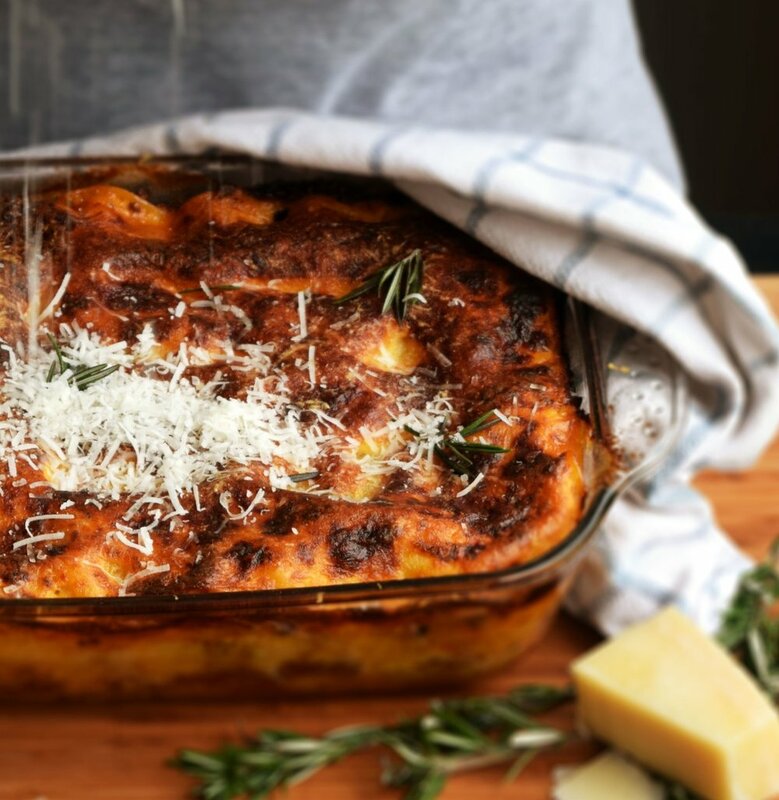 To construct the lasagne simply layer up the ingredients in an ovenproof ceramic or Pyrex dish. For those of you, like my mum, who is never sure which order to put the layers in, it should be: pasta - bolognese - pasta - cheese sauce - bolognese - pasta - cheese sauce - bolognese - pasta - cheese sauce. Always finishing with a layer of cheese sauce on top. This is the order that I use anyway and it works well! Sprinkle the finely grated parmesan all over the top and bake in the oven for 1 hour, or until the pasta is cooked and the lasagne is bubbling and crusty on top. Enjoy with some salad and a nice glass of red wine. Rich and flavoursome lasagne - the perfect comfort food.